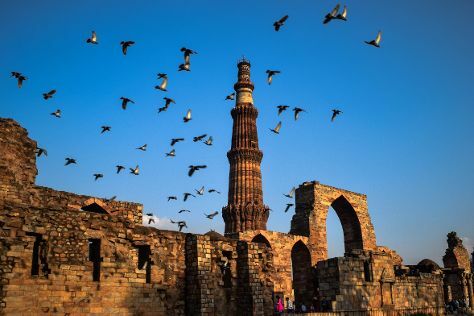 Start off your visit on the 2nd (Wed): admire the landmark architecture of Qutub Minar, admire the landmark architecture of Humayun's Tomb, then contemplate the long history of India Gate, and finally see the interesting displays at National Museum. Keep things going the next day: don't miss a visit to Red Fort (Lal Quila), take in nature's colorful creations at Akshardham, and then take in the spiritual surroundings of Birla Mandir Temple (Lakshmi Narayan). To see where to stay, other places to visit, photos, and other tourist information, go to the New Delhi road trip planning app . Pendleton, USA to New Delhi is an approximately 30-hour flight. Traveling from Pendleton to New Delhi, you'll lose 13 hours due to the time zone difference. Traveling from Pendleton in October, things will get much warmer in New Delhi: highs are around 93°F and lows about 69°F. Finish your sightseeing early on the 3rd (Thu) to allow enough time to drive to Agra. Kick off your visit on the 4th (Fri): step into the grandiose world of Agra Fort, then admire the striking features of Jahangir Mahal, and then admire the striking features of Taj Mahal. For photos, ratings, where to stay, and tourist information, go to the Agra tour itinerary planner . Drive from New Delhi to Agra in 3 hours. Alternatively, you can take a train; or take a bus. Expect a daytime high around 94°F in October, and nighttime lows around 68°F. Finish up your sightseeing early on the 4th (Fri) so you can travel to Varanasi. Start off your visit on the 5th (Sat): contemplate the waterfront views at Ganges River and then take in the local highlights with Walking tours. To see reviews, ratings, other places to visit, and more tourist information, read our Varanasi route site . Traveling by flight from Agra to Varanasi takes 2.5 hours. Alternatively, you can drive; or take a train. October in Varanasi sees daily highs of 90°F and lows of 72°F at night. Wrap up your sightseeing on the 5th (Sat) to allow time to travel to Konark. Kick off your visit on the 6th (Sun): admire the striking features of Konark Sun Temple. To see photos, more things to do, maps, and tourist information, go to the Konark holiday builder tool . Use the Route module to find suitable travel options from Varanasi to Konark. In October in Konark, expect temperatures between 89°F during the day and 74°F at night. On the 6th (Sun), you'll have the morning to explore before heading off to Hampi. On the 7th (Mon), delve into the distant past at Group of Monuments at Hampi, make a trip to Elephant Stables, then take in the spiritual surroundings of Royal Enclosure, and finally steep yourself in history at Vitthala Temple. To find more things to do, where to stay, photos, and more tourist information, go to the Hampi trip website . The Route module can help you plan travel from Konark to Hampi. October in Hampi sees daily highs of 86°F and lows of 71°F at night. Finish up your sightseeing early on the 7th (Mon) so you can travel to Jaipur. On the 8th (Tue), look and learn at Jantar Mantar - Jaipur, take an in-depth tour of City Palace of Jaipur, then look for gifts at Jaipur Blue Pottery Art Centre, and finally identify plant and animal life at EleSafari. On the next day, admire the landmark architecture of Hawa Mahal - Palace of Wind, step into the grandiose world of Jal Mahal, then step into the grandiose world of Amber Palace, and finally admire the striking features of Sheesh Mahal (Hall of Mirrors). To see where to stay, reviews, and tourist information, go to the Jaipur itinerary planner . You can fly from Hampi to Jaipur in 7 hours. Other options are to do a combination of train, taxi, and flight; or drive. Traveling from Hampi in October, expect nights in Jaipur to be about the same, around 71°F, while days are somewhat warmer, around 95°F. Wrap up your sightseeing on the 9th (Wed) early enough to travel to Amritsar. 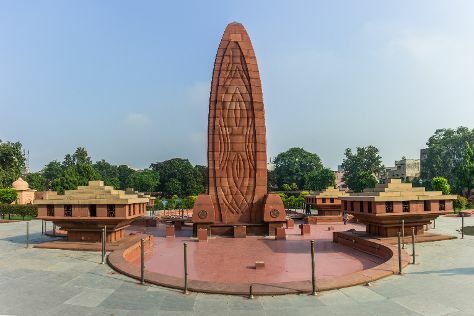 On the 10th (Thu), don't miss a visit to Jallianwala Bagh. For reviews, other places to visit, and tourist information, go to the Amritsar itinerary tool . You can fly from Jaipur to Amritsar in 4 hours. Alternatively, you can drive; or take a bus. Plan for little chillier temperatures traveling from Jaipur in October, with highs in Amritsar at 89°F and lows at 65°F. On the 10th (Thu), wrap the sightseeing up by early afternoon so you can travel to Leh. 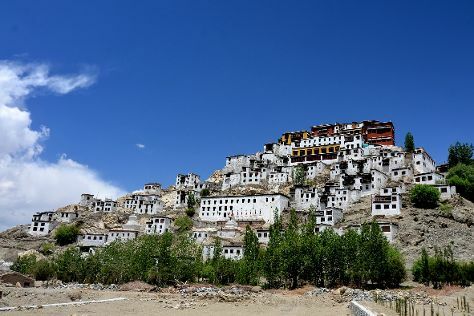 Take a break from Leh with a short trip to Alchi Monastary in Alchi, about 1h 30 min away. There's still lots to do: take in the spiritual surroundings of Thiksey Monastery, see the interesting displays at Stok Palace Museum, make a trip to Confluence of the Indus and Zanskar Rivers, and pause for some photo ops at Shey Monastery. To find more things to do, where to stay, other places to visit, and tourist information, read our Leh road trip planner. You can fly from Amritsar to Leh in 4.5 hours. Alternatively, you can do a combination of train and flight; or drive. Finish your sightseeing early on the 13th (Sun) so you can travel back home.